I'm a lucky lady. My husband has parents who shared household jobs and taught their children to do the same. Matt learned his Mum's flare for cooking and his Dad's fearlessness around irons. In this modern age it is baffling to me how many men still regard anything indoors as women's work. Recently my neighbour when poorly was 'kindly' told by her husband that she could have an early night - as soon as she'd cooked his tea that is! It's an attitude that starts very young, with kids treating their parents like slaves and then expecting to be paid for every job they do themselves. Looking after a home is something that you can make your family feel proud to help with, and in turn you will have more quality time to spend together. On top of the practical skills they will pick up, and the attitude that family units work together as a team, helping around the house is an almost Montessori style learning experience, where children master the skills to look after themselves quickly because they are allowed to play with real items, not just plastic toys. When the battery ran down on the drill for example, Toby got a chance to safely act out putting together a new kitchen in a way that stimulated him far more than his little Bob the Builder drill ever did. 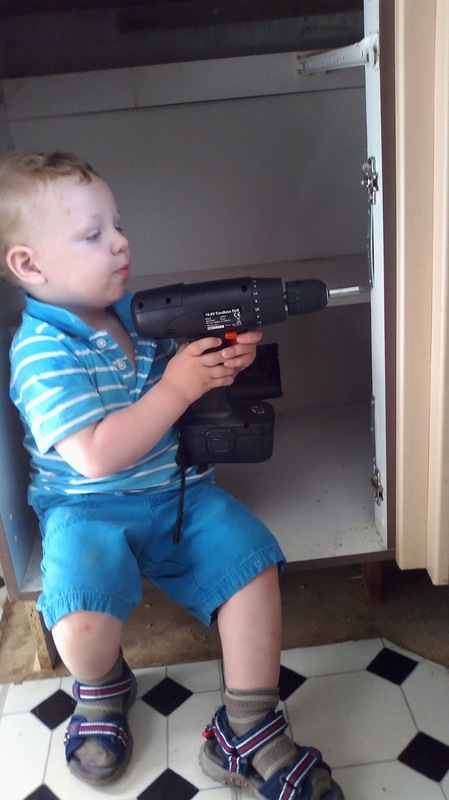 I was amazed that my 20 month old could even pick the heavy drill up, but allowing and encouraging children to help and act out helping is always full of surprises. One of the simplest ways to get kids involved in helping around the house is in letting them know right from day one (or maybe month 8) that it's up to them to help put away the things they have been playing with. I never use the word 'chore'. We just shout 'tidy away time, who's going to be the quickest!' and dive in. 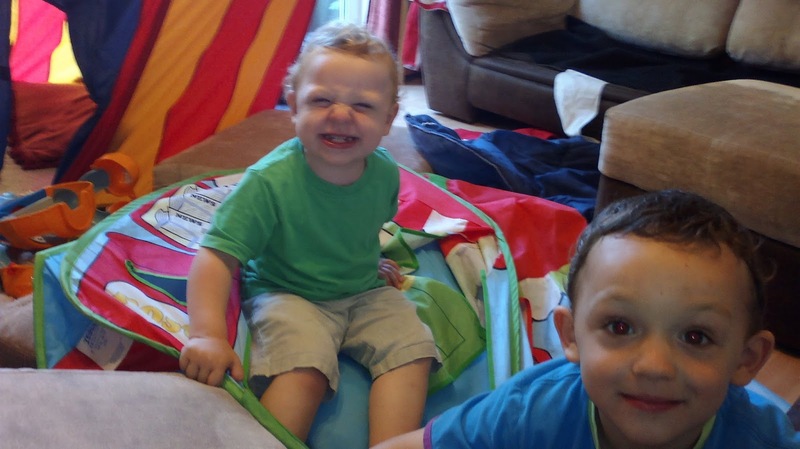 'You've pulled all the cushions off the sofa and emptied out every toy to make a boat? That's fine, but you have to help put it all back when the game is over'. When Ollie went through a phase of complaining and asking why he had to tidy away with me - 'you could just do it mummy' - I asked him if he liked the room messy all the time, or tidy so he could find the car he was looking for. He admitted he liked it tidy, so off we went in our dive around the room to see who could pile the most stuff back into the toy box the quickest. When Toby empties the bookcases, it is Ollie who does the re-shelving. Both boys enjoy helping out with all sorts of jobs, and apart from tidying up I leave it to them to decide if they want to help or not. They both like to help load and unload the washing machine, fold clothes (I secretly refold afterwards, but never when they can see me undoing their efforts), help with cooking. A couple of buckets accidentally tipped over by Ollie means floor washing is one I insist on doing by myself, as is anything dangerous such as ironing (or even better, ask Matt to do it). Pretty much anything else is fair game. The boys always want to help wash the car - Matt blames Ollie for the missed patches, but they are always strangely at Matt height, not Ollie height. They like to wash the patio door window, occasionally with actual water, mainly with pilfered greasy baby wipes. Both help to put their clean clothes away, although Toby detours sometimes from putting socks in his sock drawer to putting them down the toilet. When I hurt my back recently they were awesome in taking over weeding the patio and watering the flowers, working as a team to fill up the watering can at the tap and tip it up over the plant pots, and themselves, and each other. Today they enjoyed helping strip the leaves from corn on the cob for dinner, with some of the leaves and stringy bits even making it into the compost caddy and not just onto the floor. Preparing food is always popular with them as they get to stuff their faces. They are also a bit OCD when it comes to things that are in the wrong place in shops, regularly moving misplaced items and putting away things that have fallen on the floor. The helpfulness even extended to them insisting on helping our Viking friends to carry wooden poles for a sail tent at the show we did on Sunday - watching a baby dressed as a Viking nonchalantly carrying one end of a pole across a field made a few people smile. 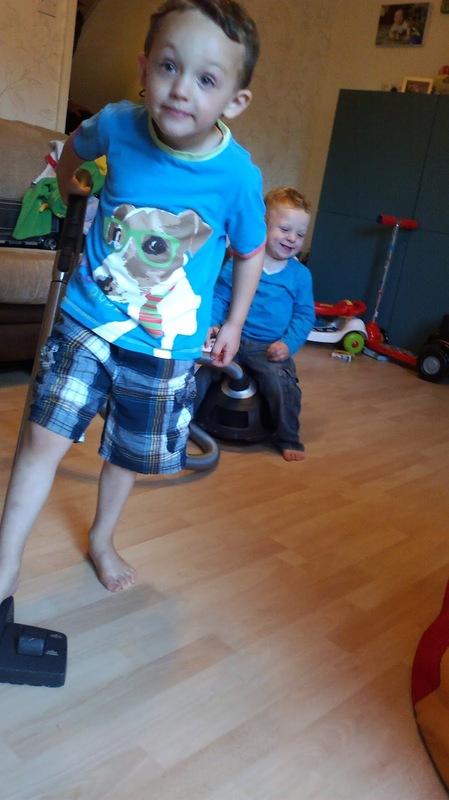 One of the absolute favourites of both boys is the vacuum cleaner. It wasn't always like this - our old upright was so piercingly noisy it sounded like a jet taking off and blew hot air over the ankles of anyone using it. Ollie used to wrap the oven gloves over his ears and scream crying every time I got it out (a couple of times a day given our mixture of mucky pup kids and show-every-crumb laminate floors). The solution came in the form of an incredibly generous gift from my parents of a new cylinder vacuum - blissfully quiet, light enough for even the smallest hands to push around, and also according to Toby it makes a great horsey. The boys love playing house and cleaning with it so much I have to mediate so that we all get a turn (I try to whizz round quickly to get the worst of the dirt and then turn it down to the lowest setting to let them take their turns). The bags are however expensive to replace, so I think that should we ever need to replace it I would consider a Dyson such as the Multifloor Cylinder vacuum cleaner that we saw on the easy to use John Lewis website. I know the concept of kids pulling their weight around the house is not a new one, but it still causes a surprising amount of debate on the parenting forums. Some folks find paying per job works for them, and argue that it instils a work ethos and the idea that if you work hard then you will be paid and can save up to buy things you want. I suspect this may be better left to big jobs for older kids, such as the teenager sent up a ladder to clean out the gutters. Other folk feel that paying for things that need to be done in order for the home to run smoothly is imprinting in children's minds that these things are menial and you should be paying a subordinate to do them. Gender equality is another issue that raises it's head. I can remember having boy jobs and girl jobs as a kid - my brother did lawn mowing and I did polishing for example (although since I had horrible hay fever this may have been more about my health than my gender). Having defined gender roles in household jobs is pretty much impractical in the modern world where relationship and work dynamics are usually light years away from the 1950s stereotypes. Having fun as a family cleaning together and showing your children that Mum can use power tools and Dad can do the laundry just as well as each other is something that will be as valuable a lesson to them as any amount of educational hothousing. So whether you have a nuclear family with 2.4 kids or any of the variety of households that are likely to outnumber the old family structure in the near future, your kids will grow up to be adults who don't feel helpless in the face of a pile of laundry, a room that needs painting or dinner guests to feed, unlike my unfortunate former housemate 'Toast Boy' who was unable to cook anything apart from beans on toast. By getting your children helping now, you are empowering them to be independent later on. This blog post was sponsored, but the opinions, anecdotes and tool wielding offspring are all my own.